From growing up in a war zone to befriending the greatest football manager in the history of the game, John White's story is remarkable. Growing up in Northern Ireland in the 1970s was tough but the prospects for John, a Catholic raised in the Short Strand area of Belfast, were even more restricted. Hemmed in on all sides by Protestants and patrolled on a daily basis by British army forces, John and his neighbours soon learned to make light of the searches, patrols and threats of attack by neighbouring communities, even accepting regular interruptions to games of street football as a daily occurence. Shining through the darkness was the one thing that united this intensely divided community. It all began with George Best, the pride of the province and hero to every schoolboy in his native Belfast. The greatest player in the world regularly turned out for the national team in the most infamous city in the world at the height of The Troubles and these were the first big football matches John watched as a child. 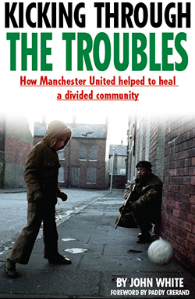 From there it was logical to follow Manchester United's fortunes and a lifelong romance was born as he joined the fortnightly exodus of Irishmen from both sides of the community to Old Trafford. Later, John founded a cross-community Supporters Club with the express aim of uniting Catholics and Protestants and their shared passion for United. It was in this role that he began hosting charity dinners in Belfast and befriending many United legends, foremost among them the Boss, Sir Alex Ferguson. It's fair to say that John's relationship with 'Fergie' was at odds with his firebrand media persona. Ever willing to help Irish charities, Sir Alex was a regular at John's events and eventually placed his trust in the Carryduff MUSC to help promote his own Elizabeth Hardie Trust charity, named after his late mother. Sir Alex became a regular visitor to John's home in Carryduff and even visited his John's father's regular haunt, a bookmaker in Short Strand. With the 1997 Good Friday Agreement, much of the daily antagonism of the 1970s has disappeared from Belfast life but not all. As John reflects on his life in the city, he takes a realist's view of the current situation in the Province. I totally recommend Kicking Through The Troubles by John White. It would make a perfect stocking-filler at Christmas or an ideal gift at any time. John D.T. White is the author of numerous books, but the Red Devils have always been his first love, and this is his eighth book featuring his beloved United but in this instance also dealing with societal issues. He is the founding member of Carryduff Manchester United Supporters' Club, the largest official supporters club in Ireland. He has been a season ticket holder at Old Trafford for more than 25 years. He lives in Carryduff, County Down, with his wife Janice and two sons, Marc and Paul.